Imagine for a moment the following situation: Your 75-year-old mother has fallen and broken her hip. After leaving the hospital, who is going to be there to help her through recovery? She lives alone and needs help around the clock until she gets back on her feet, but you live out of town. This is just one of the many scenarios in which the need for non-medical in-home care comes into the picture. Non-medical in-home care services can benefit seniors, children, persons with disabilities, those with chronic health conditions, and anyone whose quality of life can be improved by having a caregiver help in their home. The overall goal is to provide effective, appropriate and cost-effective assistance to individuals enabling them to maintain their independence, comfort and security. In recent years, the level of care required by home care users has increased and is likely to continue to do so in the foreseeable future. The main cause of the increase is due to aging baby boomers, those 76 million Americans, including over 1.5 million Arizonans, born between 1946 and 1964 who are fast approaching retirement. The number of individuals who elect to remain in their homes rather than move to a retirement center continues to grow. Many individuals and their families choose in-home care out of a desire for a higher quality of life and independence. In-home care provides a range of assistance such as personal care including: bathing; dressing and grooming. The in-home care worker can also assist with daily chores such as shopping, meal preparation, laundry, housekeeping and companionship. Using an in-home care provider enhances the general well-being and quality of life for the clients. This puts their families at ease and allows clients to live life on their own terms. It is important that caregivers employed by the agency are bonded, insured, certified in CPR and Fist Aid, TB tested, have obtained Fingerprint Clearance cards and have cleared a background check. The agency does the bookwork, provides the supervision and discipline, carries the insurance, and ensures that all shifts are covered. Family members always have been and still are the major provider of long-term care. This heavy burden should not be faced alone, and many caregivers need guidance, support and skills to manage, the sometimes, complex care. 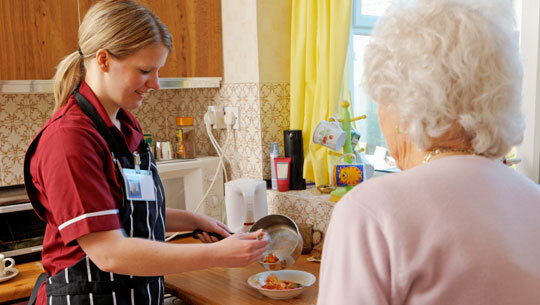 The quality of care your loved one receives is a joint effort between you and the care agency. Whether you or a family member needs assistance, it’s comforting to know there are qualified non-medical in-home care providers. As the population continues to age, the need for non-medical in-home care will continue to grow. Choosing the right care will give your loved ones the quality of life they deserve. For 23 years, The Caring Presence has provided quality non-medical in-home care. Offices in Yavapai County are located at 1024 Willow Creek Rd - Suite B, Prescott AZ 86301, (928)771-0701; 649 E Cottonwood - Suite 5, Cottonwood AZ 86326, (928)639-2166.